It seemed appropriate to publish this article in the context of the rupture we are experiencing today with the United States. The misunderstandings and mistakes made by their new President Donald Trump in his statements about the European Union and the European states reveal the deterioration and dysfunction of the American education system. 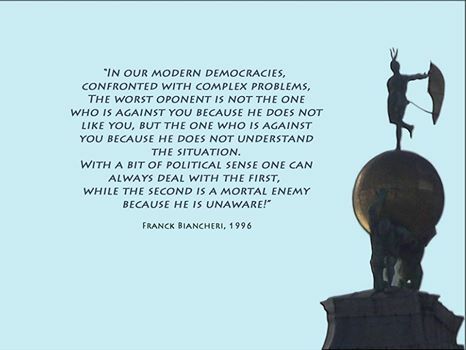 This text by Franck Biancheri was written in late January 2005, just after Bush’s second inauguration. Rather than advocating a rupture between the European and American peoples, he called on Europeans to be the initiators of dialogue and cultural and intellectual exchanges by offering students and young Americans to leave their continent. Today, as the Trump presidency claims protectionism and America first, on the occasion of the 30th anniversary of the ERASMUS program, it would be useful to launch such an initiative, strengthening Erasmus mundus, and strengthening the links and mutual understanding between the rising generations of a mulitpolar world. “The common transatlantic interest, the need to increase EU understanding for the new US generations and the urge to avoid the intellectual inward-looking trends among US youth, are all reasons for the EU to launch such an initiative.”, he wrote, what was true yesterday is occurent today. US International Education: Saving Student Ryan! In addition, the exposure of young Americans to international topics in primary and secondary education has practically disappeared, resulting in the emergence of entire generations of US citizens totally unaware of the rest of the world. This trend is strengthened by the parochialism of the US media. Such trends affect American relations with all other continents; but it particularly affects transatlantic relations that used to be based upon large-scale population exchanges between the two shores of the ocean, enabling our visions of the world and of the future to be shared. In brief, we need to ‘save student Ryan’ before he becomes lost in his North-American maze. Having had the opportunity to analyse this trend since 1991, I have noticed year after year the damage to the younger generations of Americans who no longer have, so to speak, the intellectual tools to understand the outer world. This tendency was reinforced during George W. Bush’s first mandate, which de facto advocated total disregard for opinions from the rest of the world, triggering strong anti-American feelings worldwide, which in turn resulted in reducing significantly the amount of foreign students in American universities. This simply results in cutting US new generations from any external influence. Europe needs to act to increase significantly the amount of US students visiting Europe. The European Union provides a unique academic framework which would enable US students to spend two semesters in two different European universities, companies or regions, to discover what diversity means. The common transatlantic interest, the need to increase EU understanding for the new US generations and the urge to avoid the intellectual inward-looking trends among US youth, are all reasons for the EU to launch such an initiative. Fifty years ago, the US pioneered large-scale exchange programmes designed to open young generations’ and future elites’ minds (in particular those of post-war Europeans) and to promote the US image among these categories of age. Today it is the Europeans’ turn to ‘return the favour’ and launch the ‘Jean Monnet Transatlantic Grants’ programme. This grant programme should be ambitious: on the one hand because it is an emergency situation, and on the other hand because we are talking about a country with 300 million inhabitants. Taking advantage of President Bush’s visit to Europe next month, and knowing that there won’t be much for European (and US) leaders to offer during their vibrant speeches on the importance of the Transatlantic relation, it would be sensible to announce the launching of such large-scale project by the EU. The programme should reach 20,000 young Americans per year for at least five years (i.e. 100,000 by the end of the decade) for a significant generational impact; this would imply a 50 million euro budget per year. It could be announced by the Luxembourg presidency in February after a meeting with President Bush, approved by the European Parliament before summer, and implemented by the Commission for a full launch at the beginning of 2006. This would be a two-fold demonstration of transatlantic seriousness and of European efficiency. Let’s be aware of the fact that, in the US, such a decision coming from the EU would raise some very positive reactions among the academic and diplomatic spheres, students, multinational companies, and citizen networks, who are trying to fight against the decline of international education. And for President George W. Bush, it would be a very tangible sign that Europeans and Americans are still ready to look to the future together and in the same direction. So why are we waiting. Let’s ‘Save Student Ryan’ now? Franck Biancheri was invited in 1991 for a one-month visit by the US government as part of his “Young European Political Leaders” program (see his biography), and in 1997 the European Commission asked him to form the team of Europeans who will participate in the workshop “New technologies” of a major congress organized in Washington and supposed to associate the civil society to the relations EU / USA. The TIESWEB (Trans-Atlantic Information Exhange System on the web) project, which became the main innovation in this field in the following decade, led Franck Biancheri to discover two-thirds of the country’s states and meet A very large sample of American society (see his organizations).